The CG reboot of the classic Leiji Matsumoto franchise Harlock Space Pirate is now available on 3D Blu-ray and DVD in the UK from Manga Entertainment. Shinji Aramaki's feature is drop-dead gorgeous, so it's worth watching at the best possible quality (preferably on the biggest screen you can find).To celebrate the occasion, Manga have released a shiny new trailer which you can find below. 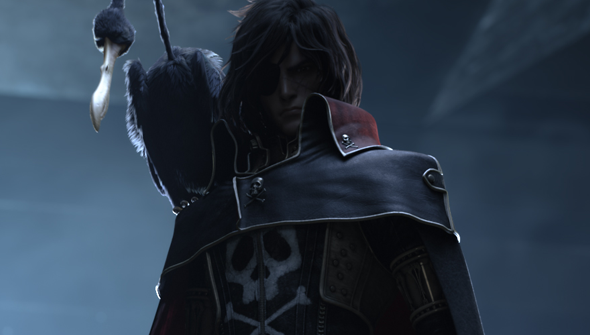 The film follows the infamous space-faring Pirate Captain Harlock and the crew of the iconic ship Arcadia, as they struggle against the dastardly Gaia Commission. It's got some of the most stunning looking CG animation we've seen to date, and some highly exciting, well-executed action. Check out our full review for more.